During the night, Patrick’s temperature got higher (but just under the official fever line) until, at midnight, he woke up feeling uncomfortable. The nurse brought him some pain medicine and it seemed to break. By this afternoon, Patrick’s temperature was back to normal. Who knows what exactly triggered the change, but he certainly seems to feel better today. Today’s been very VERY quiet. So much so that Brian and I are getting more than a little stir crazy. We held our first family Primary (sunday school) this morning. We colored. We went for several walks the entire length of the pediatric unit. Patrick and I snuggled up and read books. We played with almost all of Patrick’s toys. And we got to video chat with my family at the end of their Sunday dinner. Patrick’s feeds are up once more. And otherwise, things still seem to be moving in the right direction. So – with so little news, I thought we’d start a little educational series about what changes transplant means. Let’s start with what changed. Patrick was born with Short Bowel Syndrome meaning that his entire small intestine and 2/3 of his large intestine were missing. 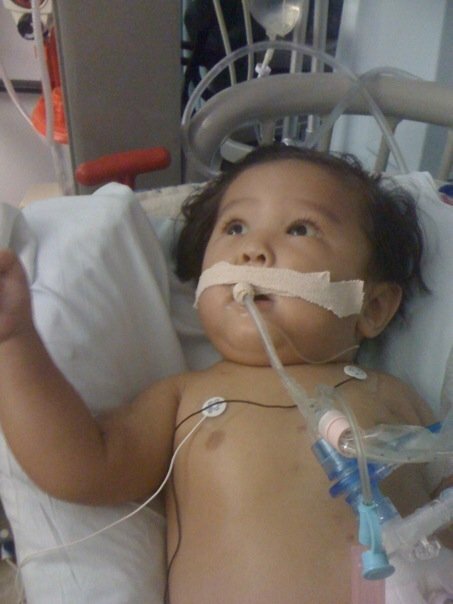 Over time, his liver has become scarred by TPN. So he had a multivisceral transplant. 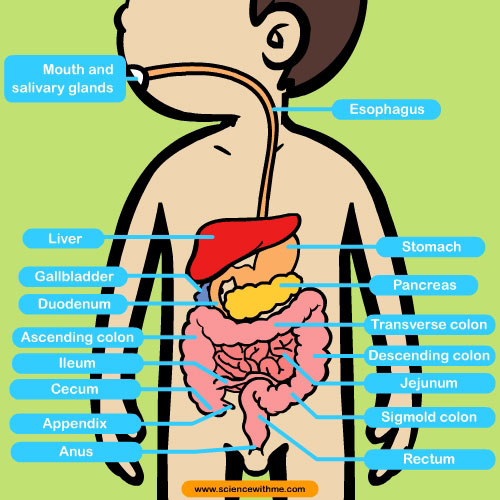 This is the anatomy of a normal GI tract. The greyed out portions are the parts of Patrick’s anatomy that were missing. The in this image, the purple portions are what was transplanted. Patrick was given a new liver, duodenum, small intestine and pancreas. The pancreas comes along as part of the liver/intestine transplant package because those organs are all connected. To make room for the new organs (and because of other complications) they removed both Patrick’s gall bladder and spleen. Normally, they also remove part of the stomach to make room for the transplanted organs to swell. However, because we asked for Patrick’s g-tube to be saved (because we didn’t think he’d be good long-term needing a tube in his nose) the surgeon saved most of his stomach, but divided his duodenum into a Y shape that should keep him from having too much trouble with reflux. (The sphincter of the stomach can’t be saved in this type of transplant, so they have to build in a different mechanism. 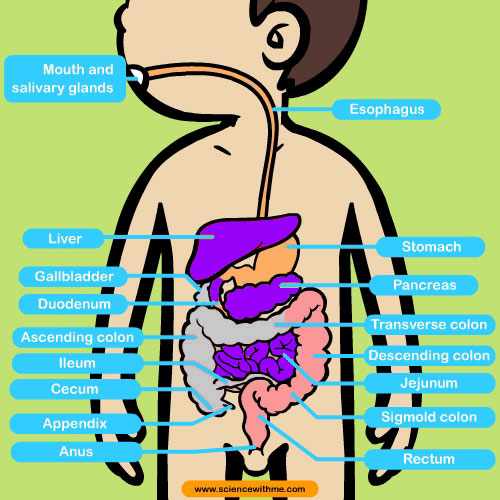 Also, for some reason making the stomach smaller in transplant is important because most often the underlying disease makes the stomach not work as well.) If you follow along with medical stuff at all, this procedure is called a roux-en-y. Having no spleen does leave Patrick with an extra level of being immune compromised. He’ll have to be on penicillin for the rest of his life. However, his spleen had been so damaged because of infection and TPN-associated liver damage that it wasn’t going to do him much good anyway. Kids with intestine problems often develop problems with their gall bladders, too.. so that just got to go. Obviously, this was a huge surgery, as they removed or replaced pretty much everything between Patrick’s stomach and colon. And that means a lot of immune suppressants to prevent rejection. But, the new liver will actually help prevent rejection of all the other organs. And that is what we’ll call Patrick’s new anatomy 101. This entry was posted in Recovery, Transplant and tagged gallbladder, hospital stays, intestinal transplant, liver transplant, multivisceral transplant, spleen, transplant on November 17, 2014 by geekino. Infection is a vicious cycle! The cure makes you vulnerable for further infection. A couple of posts ago I wrote about a bacterial infection that hadn’t been fully treated by antibiotics back in February. Well, at the beginning of last week that same infection grew back yet again! We don’t know exactly why, but as a result we spent a few days in the hospital while they worked out a treatment plan that would help to knock this infection out for good. The plan included a change to the antibiotics he takes to control overgrowth of bacteria in his gut and a regimen of super high dose IV antibiotics prescribed for the next 6 weeks. We were sent home on Thursday without Patrick ever having really been too sick. We joked that it must be time to plan a family vacation because with so many antibiotics, how could Patrick possibly get sick again? That’s what we get for uttering the word “vacation”. Tuesday of this week Patrick wasn’t a very happy kid. He followed me around all day just wanting to be held. That night, he got another fever. At midnight, when it was rising, we called one of our favorite doctors at the hospital, Molly O’Gorman. She also couldn’t explain the fever, given the antibiotics, and so she recommended we stay at home till morning with the hospital would be less busy. So, we gave him some Motrin for his fever and I set my alarm clock to get up every hour to check to make sure he was still ok.
At 5 a.m. Patrick woke up just screaming. By 6 his fever was back and climbing rapidly. We gave him more Motrin to keep him from getting into even more danger and took him to the ER. He seemed to feel ok with the Motrin and the doctors were stumped as to the cause of the fever. But throughout the night he just got sicker and sicker. Every time his fever reducers wore off he’d have chills and high fevers and nausea. His first night in the hospital was just miserable! I think we slept a whole 3 hours. By morning, the blood cultures came back with a definitive result, Patrick had a yeast infection in his central line. For those of you who don’t know, Patrick fought a yeast infection for most of last summer.. and almost lost that battle. Yeast has to be the scariest bug I’ve ever seen him with. Unfortunately, this infection doesn’t seem to be much of an exception. Yesterday was an eventful and stressful day. Because yeast loves to set up shop in catheters, Patrick’s central line had to be taken out yesterday. He’s strong and wiggly and fiesty enough now that he has to be sedated for this to happen. This had a few ramifications for him. First, he had to have a transfusion. His spleen gets greedy whenever it’s sick and he becomes anemic. He’d fare ok for normal things, but in that state would not have been strong enough for anesthesia. The transfusion helped his blood counts, but it also further fed his blood hungry spleen and as a result he’s all puffy , swollen and sore today. His belly is hard as a rock and hurts, too. Also, Patrick still has to have IV’s to keep up his blood sugar and give his medications. Right now, he needs 1 all the time, and 2 most of the time. But between the scarring and damage to his veins from previous IV’s and the effects of this bad infection, they’re having a hard time getting them in, or finding places to draw blood from for needed blood tests. Yesterday, he was poked over 10 times in 12 hours. My poor little munchkin is sore and sad and sick. He has to have splints on his hand and arm to keep his IV’s from being pulled out, so playing with toys is frustrating. The good news is that pulling out the line and treating with antifungals is helping. He hasn’t had a fever since last night! And this morning, for the first time in days, he is resting well enough that I was able to put him down. Hence, I found time to write this blog. I apologize for the lack of pictures so far. When I get a minute, I’ve got some adorable stuff from our hospital stay a couple of weeks ago. This stay so far Patrick hasn’t felt well enough for us to do something as frivolous as picture taking… but now that he’s on the mend, I’ll be doing that soon. As for mom and dad, well.. we’re pretty darn exhausted. It’s been nearly impossible to get a good night’s sleep.. or even to get a nap in. On top of that, we’re worried. We still have bad memories and plenty of heartache from our last experience with yeast infections. It’s scary to be facing one again… And it is the hardest thing in the world to watch your child suffer and not be able to take the pain away. Still, all we can do is live each day as its given to us. It is more than a miracle that Patrick is still with us. He fought so hard to be here and is fighting still. We are doing all we can to make sure that he gets the best out of each moment he’s here. We’ll keep you posted as we know more. For now, it’s just a matter of waiting for the medicine to do it’s job and then keeping these two infections from coming back. This entry was posted in Bacterial overgrowth, Central Line, Infections, Liver problems, Medical updates, Short Gut Syndrome and tagged Broviac line, central lines, fevers, infections, IV's, Primary Children's Hospital, scary moments, spleen, the ER, transfusions, trials and triumphs on March 19, 2010 by geekino. WARNING: THIS POST INCLUDES DETAILS OF PATRICK’S CARDIAC ARREST AND SUBSEQUENT PROBLEMS IN THE ICU, INCLUDING PICTURES. I’ve been asked to explain several times the events of this week. I’ve decided it’s probably easiest if I just take some time to sit down and write this in a blog. It will save frequent emotional repetitions for me… preserve some of the last week while it’s still fresh in my mind… and hopefully give some answers for those who are wondering how things got to where they are. These are things that are still hard for me to remember and talk about so please don’t be hurt if I don’t want to talk more about what I’m posting in this entry. In my last post, I wrote about a yeast infection called candida that Patrick had in his central line and in his blood. He was hospitalized for 11 days in June for that infection and then went home on antifungal medications. 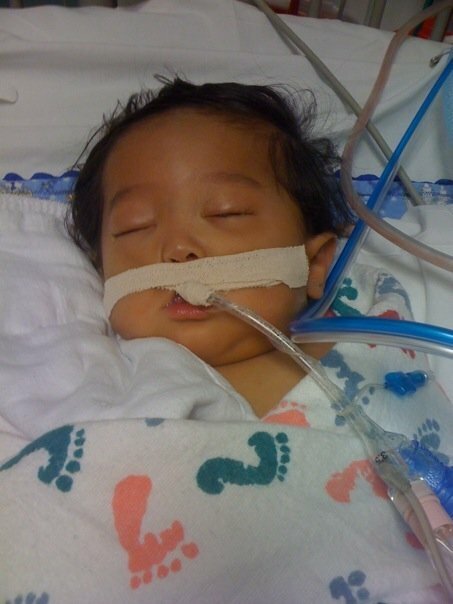 On July 5th his fever returned and we came back to the hospital to learn that the infection had grown back again. In order to treat the persistent infection, they decided to return to giving him a very dangerous medication called amphotericin (a.k.a. “ampho-terrible”). He was on a very high dose but seemed to be doing ok. He always got chills while it was being given and wanted to be held and held very still, but all other signs pointed towards it doing it’s job without too much problem. On the 15th, we were making plans to go home. We would give 3 more weeks of treatment at home to make sure the infection didn’t come back. However, before we went home, we decided to try giving the medication the same way he’d get it there. This meant shutting off his TPN (IV nutrition) for a few hours while the medicine was being administered. He’d been doing so well that I ran home to shower and take care of a few things right before they were supposed to start the ampho. I got back an hour into it and he just didn’t seem to be tolerating it well. His hands were as cold as ice, despite several blankets and heatpacks. He was pretty restless. We tried to feed him to comfort him, but that just make him sicker. About 3:30 p.m. he got really agitated and started to squirm and pull at his ears and cry. Then he just went limp. I called his nurse in and she called in one of the charge nurses. They took him from me and started administering CPR. They also hit a button on the wall that pages for a “Code Blue” on the PA system. In under a minute the room was filled with people. A PCT who had cared for Patrick before came immediately to my side, as did a social worker and they stayed with me until we were delivered into the hands of another social worker in the PICU. One doctor took charge of calling out orders while another kept track of everything that had been done. There were at least 10 people bedside helping with CPR, medications, watching vitals and I don’t know what else. After about 15 minutes (a.k.a. 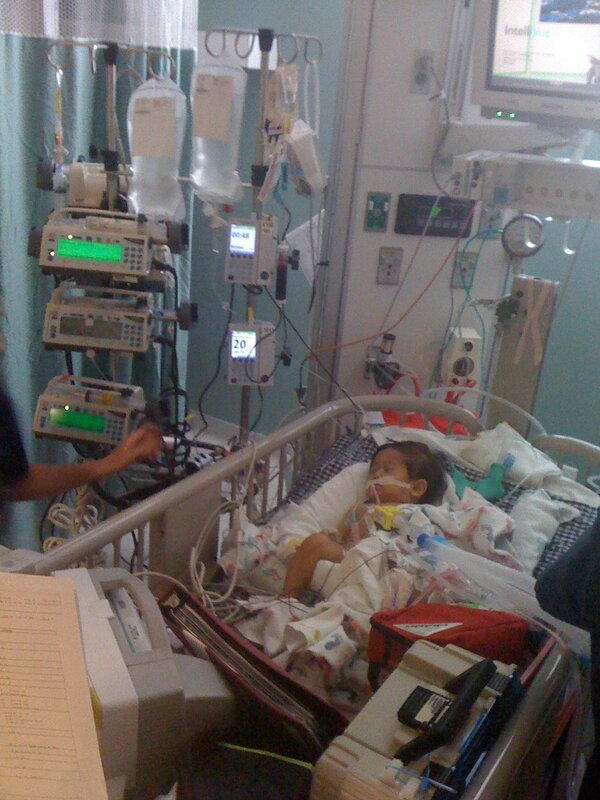 an eternity) they finally revived him and they took Patrick straight to the Pediatric ICU. I followed with the social workers and his nurses in another elevator. On the way up I finally got a hold of Brian and told him to come up and where to find us. 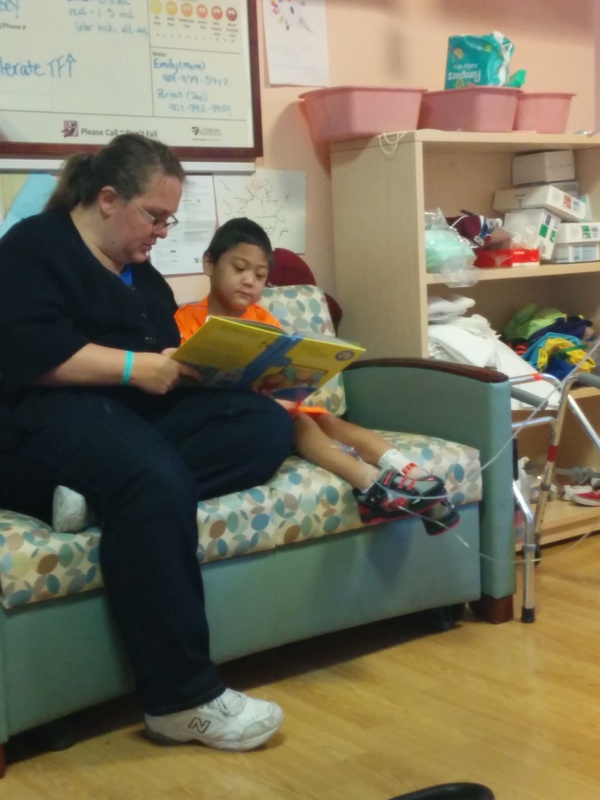 Normally parents are taken to a waiting room, but they knew us and how involved we are with Patrick’s care so they let us stay and watch as they placed an arterial line to monitor his blood pressure and worked to find out what happened. The best guess is that his weakened little body was hit with a few things at once. Being off his TPN caused his blood sugar to drop. At the same time, his weakened kidneys weren’t processing potassium in the right way. When those two things hit at the same time, it created a sort of perfect storm that caused him to seize and caused his heart to stop.The next day they worked madly to stabilize him. His organs had been starved for oxygen for long enough that they’d forgotten how to work. His blood sugar was all over the charts. His potassium levels were out of control. He was anemic and his platelet count just kept dropping. His nurse that day didn’t sit down for the entire 12 hour shift. Over the next few days things started to stabilize but there were a lot of things out of whack still. His spleen, which had already been in bad shape because of his cholestasis (liver damage) and prolonged infection, decided to protect itself by sequestering all the platelets that went through it. As a result, although they were giving multiple transfusions, his platelet count was still low and he was bleeding easily from anywhere that could bleed. His kidneys also had kind of shut down and so all of the extra fluids being poured in to give transfusions and electolytes and medicines weren’t being cleared by his body. Instead they were soaking through the veins and collecting in the other tissues of his body. To top it all off, he had some bacteria “leak” from his gut and get into his bloodstream causing a bacterial blood infection. Saturday they tried to extubate him, but by Sunday morning it was pretty obvious that he was having trouble breathing. X-rays showed that the fluid in his tissues had made it’s way into his lungs. And so they had to put him back on the ventilator and started to give him medicines to make his body shed the extra fluid. We watched and prayed and waited and tried to get ready to say goodbye until Wednesday when something amazing happened. Patrick peeked at me through heavy eyelids and seemed to know that I was there… He started reaching with his hands and so I gave him a rattle… and he shook it! The next day I was actually able to get him to laugh! As the day went on, he woke up little by little and started to play peek-a-boo and smile and hold toys. His X-rays and labwork improved. 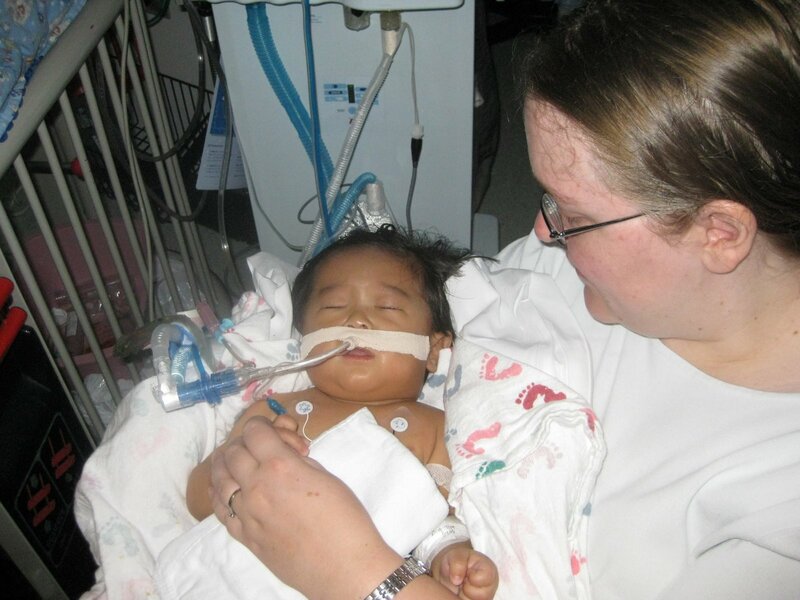 As he woke up, they started to wean him slowly off the ventilator and off the sedatives. 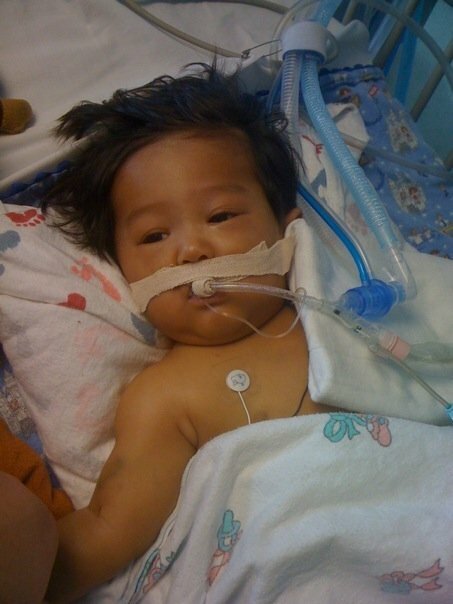 His throat was very swollen and we weren’t sure if the airway would stay open without the tube in. But Friday evening they decided the only way to know would be to try. So they took him off the ventilator and put him on high flow oxygen. And he was the happiest kid you could imagine. Without the breathing tube to bother him, they were able to turn off his sedatives and we became aware of what might be another problem. We noticed as Patrick started waking up that he wasn’t focusing his eyes well… staring off into space and not always following what’s going on in the room. He’s also been holding his head and arms very still. When these issues didn’t go away when the sedatives started wearing off, we became more concerned. Neuro came to see him and said that they think there is reason to evaluate him. He will have an MRI on Monday as well as a neurodevelopmental workup. There is a possibility, especially considering how long he was down, that Patrick’s brain was damaged. Neuro will be able to help us see if that is true… and if it is, they’ll help us do all we can to help him do the best that he can. Regardless of how weak his body is, though… the spirit inside of it is still Patrick’s. His eyes still sparkles and he loves to play and laugh with us. It has been a gift to be able to hold him and play with him again… to know he knows us and loves us still. It breaks our hearts to see that magnificent spirit confined by such a weak little body and we hope that those limitations will be brief. 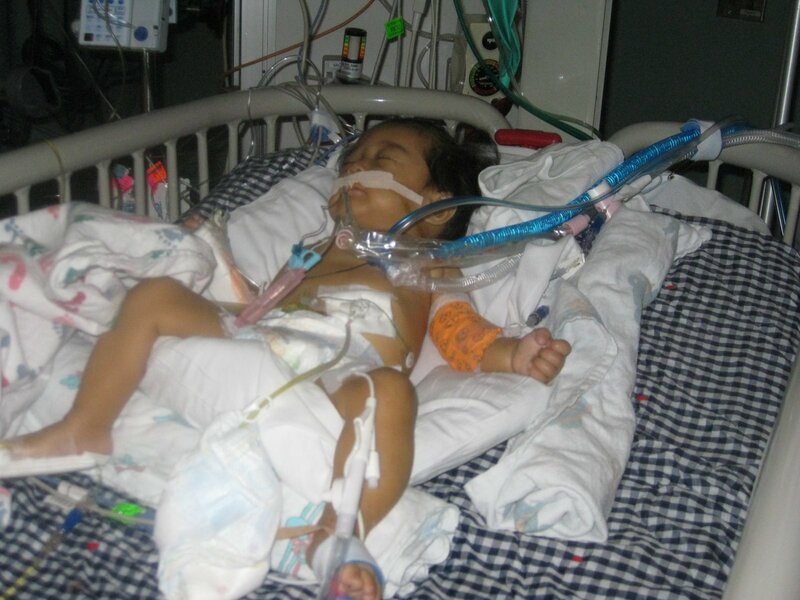 As far as long term planning- Patrick will need to stay in the ICU until he is better able to breathe on his own. He is doing it right now, but he is working very hard at it. 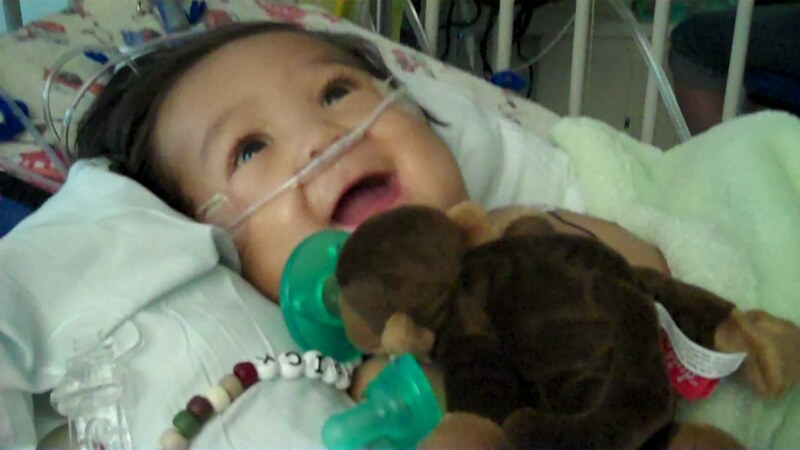 He’s on hold for transplant until he can go back to Seattle for another evaluation. At the very least, he will probably now need a liver transplant along with the small bowel transplant. 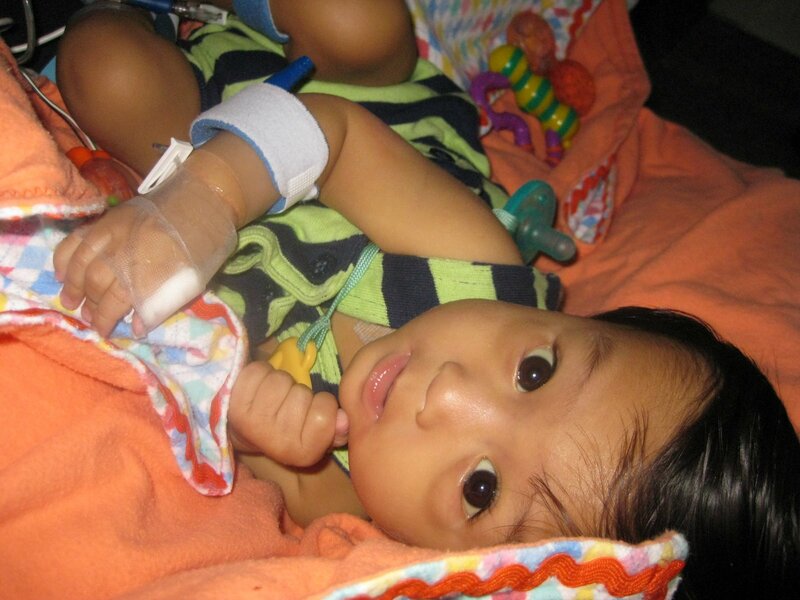 We won’t know if he’s still healthy enough for transplant, though, until he is evaluated again. We’ll continue working with the doctors and therapists and nurses here to help Patrick regain as much as he can. And the rest we’ll leave in the Lord’s hands. We’ve always known that there was a plan for Patrick’s life. We’re just humbled to get to be the parents in that plan. We trust Heavenly Father to take care of the rest. This entry was posted in Cardiac Arrest, Faith, Infections, Life as an SBS mom, Medical updates, Priesthood, Short Gut Syndrome and tagged amphotericin, anoxic brain injury, cardiac arrest, CPR, faith, fevers, hospital stays, intubation, miracles, nurses, PICU, Primary Children's Hospital, proud moments, scary moments, special needs parenting, spleen, TPN, trials and triumphs on July 25, 2009 by geekino.